The cytoplasm of P. multimicronucleatum like all other cells contains a large number of organelles that are membrane bound. Membranes are used to compartmentalize and isolate metabolic and enzymatic processes within a continuous cytosol and cytomatrix which is the background phase of the cytoplasm. The principle site of biogenesis for secretory proteins, lysosomal hydrolases and membrane lipids and proteins is the endoplasmic reticulum, a system of membrane cisternae and tubules. 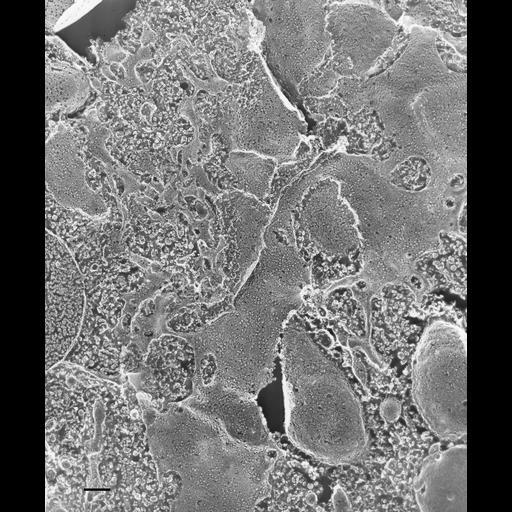 This quick-freeze deep-etch preparation of a living cell shows an extensive fracture through the ER showing its P-fracture face. Intramembrane particles (IMPs) form clumps and patterns rather than being evenly spread within the membrane. Some of these IMPs probably represent sites of ribosome attachment to translocons. Translocons are intramembrane pores through which proteins are translocated into the ER during their translation. The flattened ER cisternae morph into tubular ER. TEM taken on 6/5/91 by R. Allen with Zeiss 10A operating at 80kV. Neg. 19,800X. Bar = 0.2µm.